Engineered rubber haul truck lining systems to help improve material processing operations. Haul Truck Liners by Corrosion Engineering are made with the highest quality, highest tensile rubber in the industry, developed to considerably outlive rubber and steel liners made by other manufacturers. Additional benefits include a lower possibility for structural damage to the box and chassis, reduced noise, less carry-back, faster installation, and improved driver safety. Whether moving material from the pit to the crushers or overburden to dump sites, Haul Trucks have to face extreme impact conditions when the shovel discharges the load on the Box. The high stress conditions derived affect the suspensions, chassis and generate permanent strains and deformations on the box itself. In addition, the Truck Operator endures high noise levels and uncomfortable movements in the cab. In order to improve these operating conditions, Corrosion Engineering proposes lining the Truck Bed with Rubber Liners instead of High Brinell Steel plates. 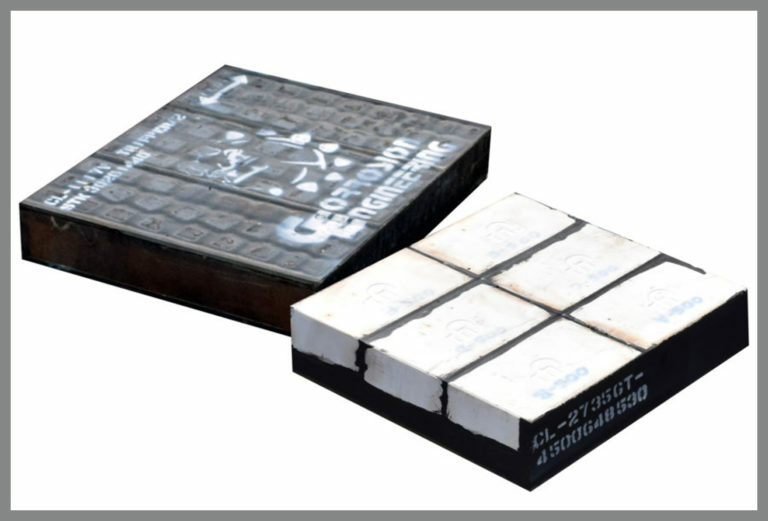 The rubber compounds developed for this application employ top quality raw materials which yield an excellent compound engineered exclusively for this application. These compounds offer high tensile strength, superior impact and abrasion-resistant characteristics, outstanding chunking resistance and superior bonding to steel. Mixed in our own factory to exacting specifications, and pressure molded to various substrates, these compounds offer the highest wear performance available in the market. The installation process has been perfected to make it as quick and easy as possible to install our Haul Truck Lining Systems. Recently, our 3-man field service team installed 3 Haul Truck Lining Systems in an average of under an hour and 30 minutes each. Compared to steel linings, Corrosion Engineering liners are installed 20 times faster. We offer complete field service to install or assist in the installation of our Rubber Truck Bed Liners. After over 3 decades of experience, truck beds lined with our Rubber Haul Truck liners have proved to be very long lasting, maintenance free, and most importantly, the cost/benefit ratio is excellent.